A composition containing a polyoxyalkylene polymer for cleaning fabric articles, especially articles of clothing, linen and drapery, with lipophilic fluid provides improved cleaning of soils while providing excellent garment care, especially for articles sensitive to water. This application claims priority to U.S. Provisional Application Serial No. 60/318,651 filed Sep. 10, 2001. Polymeric substituted oxiranes such as Polybutylene oxide polymers (BO) and polymers of higher molecular weight polyalkylene oxides, with or without hydrophilic substitution(s), aid soil removal for washing processes using lipophilic fluids, especially decamethylcyclopentasiloxane (known as “D 5”), and formulation of products for use therein. Polyalkylene oxides have better cleaning and formulatability than conventional polyethylene oxide (POE) or polypropylene oxide (PPO)-based additives, which are not able to suspend or solubilize similar hydrophilic groups in lipophilic fluids. The polymers of this invention are in many cases potentially lower in cost than silicone-derived surfactants with similar solubility properties. “Polyoxyalkylene polymer”, as used herein, means an ether-containing polymer comprising C4 or higher molecular weight alkyleneoxide monomeric units (such as butylene oxide) and/or C1 or higher molecular weight glycidyl ethers (such as methyl glycidyl ether, butyl glycidyl ether, and hexyl glycidyl ether) and having a solubility at room temperature of at least 1/2% by weight in the lipophilic fluid the polymer is to be used with. Preferred polymers have a solubility at room temperature of at least 1/2% in D5 lipophilic fluid. Preferred polymers are also capable of being functionalized with hydrophilic substituent groups such as alcohols, polyols, amines, polyamines, alkanolamines, ethoxylated and/or propoxylated amines, amides, ethoxylated and/or propoxylated amides, polyamides, urethanes and polyurethanes, oxyethylene, polyoxyethylenes, oxypropylene, polyoxypropylenes, carboxylic acids and salts, aminocarboxylates, mono and diphosphate esters, phosphonates, aminophosphonates, monosulfates, sulfonates, amine oxides, quaternized amines, phosphine oxides, phenols, polyfunctional chelant groups,and combinations thereof. Included among the polar, H-bond donating or accepting functionalities of the invention are the polar groups known as hydrophilic groups for aqueous-based surfactant systems such as are described in  The Aqueous Phase Behavior of Surfactants, Robert G. Laughlin, Academic Press, Inc., San Diego, Calif., 1994, incorporated herein by reference in its entirety. These polymers include copolymers of functionalized monomeric units with non-functionalized monomeric units (i.e., not all the monomeric units are funtionalized). Block, random, star, graft and other types of copolymers are also included. Crosslinking is also included, but only to levels that allow for polymers that are soluble in the lipophilic solvents of the invention. Ethoxylated amine and poly alcohol structures and many other polar functionalities have the ability to penetrate and/or dissolve water-soluble soils. However, these functionalities are typically not soluble in lipohilic fluids such as D 5. For improved hydrophilic cleaning, the present invention compositions utilize polyoxyalkylene polymers containing monomeric units of butylene oxide or higher molecular weight alkylene oxides at levels in the polymer high enough to provide a polymer which is soluble in the lipophilic fluid to be used. These polymers provide a cleaning additive for cleaning (including dry-cleaning) in lipophilic fluids that has the appropriate chemical forces for penetrating water-soluble soils and is highly soluble so that the soil can be suspended in the lipophilic fluid. where R 1 is hydrogen atom, or alkyl group with from 1 to 22 carbons provided that high crystallinity is avoided by branching and/or unsaturation as needed, R2 is selected from the group consisting of C2 to C20 linear or branched, saturated or unsaturated alkyl groups, C2-C23 ether-containing, linear or branched, saturated or unsaturated alkyl groups, C6-C12 aryl groups, C7-C12 ether-containing aralkyl groups and combinations thereof, providing that the selection is made such that the polyoxyalkylene segment is non-crystalline or only weakly crystalline and is soluble in the lipophilic solvent of the invention. More specifically, R2 is selected from the group: a.) —(CH2)xCH3 where x is from 1 to 19, preferably from 1 to 12, and even more preferably from 1 to 10; b.) —CH2O(CH2)xCH3 where x is defined as above; c.) substituted or unsubsituted phenyl, preferably phenyl; d.) —CH2OW, where W is selected from substituted or unsubsituted phenyl, preferably phenyl or C3-C22 unsaturated or branched alkyl, preferably C3-C18 unsaturated or branched alkyl; and e.) combinations thereof. R3 is a hydrogen atom, alkyl, aryl or hydrophilic group, provided that at least one R1 or R3 group is H or a hydrophilic group, and n is 2-100, preferably 3-50.
where R8 is derived from an intermediate having two alkoxylatable sites selected from the group consisting of amines, diamines, and diols having a substituent R3 where R3 is as defined above. R9 is a linking unit, preferably the unit —C(O)R 11C(O)— or —C(O)NHR11NHC(O)— where R11 is C1-C12 alkylene or C6-C16 arylene or alkarylene. R2, R4, n, m, and p are as defined above and s is 2-50.
wherein n is from 2 to 100 and m is from 2 to 50. To a 50 ml, single neck, round bottom flask equipped with a magnetic stir bar and argon inlet is added 4.00 grams (0.0276 moles) of 2,2-Dimethyl-3-(2-hydroxyethyl)oxazolidine and 0.032 grams (0.00138 moles) of sodium metal. Mixing under argon is continued until all sodium is reacted. 0.310 grams (0.00214 moles) of the above oxazolidine sodium alkoxide mixture is added to a 7.5 ml, stainless steel, high pressure reactor equipped with a magnetic stir bar and internal thermocouple along with 3.71 grams (0.0514 moles) of 1,2-Epoxybutane (Aldrich product code: 10997-5). The reactor is sealed and with mixing, heated at 130° C. for 16 hours. A clear, pale yellow, viscous liquid is obtained. 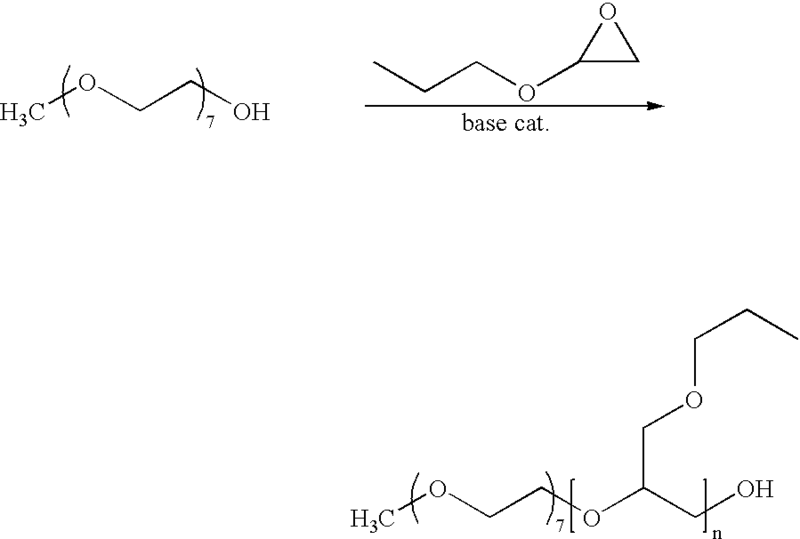 By proton NMR (CDCl 3), only a few mole % of unreacted 1,2-epoxybutane remains. Resonances at 3.2-3.5 ppm representing —(CH 2CH(CH2CH3)O)x—, 1.4 ppm representing —(CH2CH(CH 2CH3)O)x— and 0.85 ppm representing —(CH2CH(CH2CH 3)O)x— indicate the formation of poly(butylene glycol). The sample is placed on a Kugelrohr distillation apparatus at 50-70° C. at 1 mm Hg pressure to remove the unreacted 1,2-epoxybutane. Sample may be used as is or hydrolyzed to open oxazolidine ring. To a 50 ml, single neck, round bottom flask equipped with a magnetic stir bar and water cooled condenser with argon inlet is added 3 grams of the Butoxylated 2,2-Dimethyl-3-(2-hydroxyethyl)oxazolidine obtained in example above along with 1 gram of deionized water and 10 grams of absolute ethanol. With mixing under argon, solution is heated to reflux for 5 hours then concentrated by evaporating off ethanol and water using rotary evaporator to obtain a clear, pale yellow liquid. Proton NMR (CDCl 3) shows the disappearance of a singlet resonance at 1.1 ppm representing the dimethyl groups indicating the ring has been hydrolytically opened and acetone released. 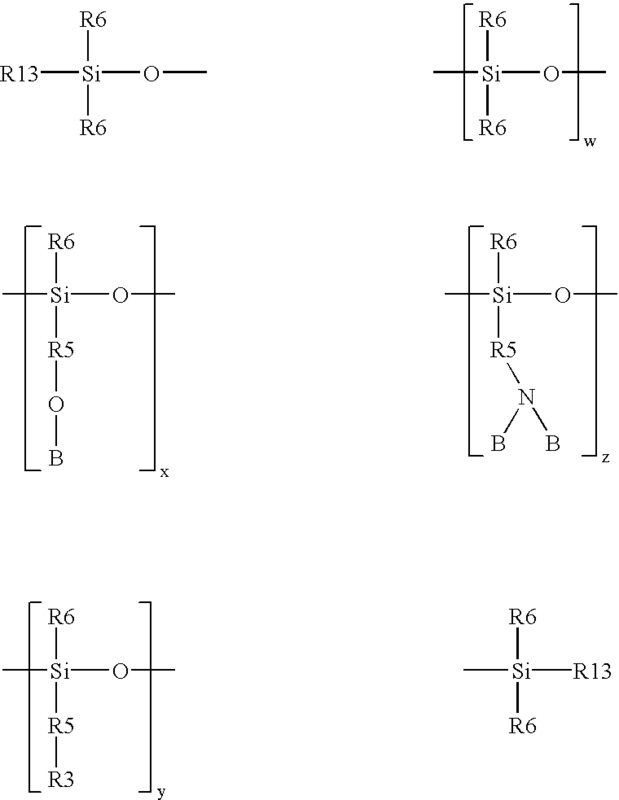 D″ is R 6 2SiO2/2 wherein R6 is independently H, a monovalent hydrocarbon group or (CH2)l(C6H4)m(A)n-[(L)o-(A′)p-]q-(L′)rZ(G)s, wherein 1 is 1-10; m is 0 or 1; n is 0-5; o is 0-3; p is 0 or 1; q is 0-10; r is 0-3; s is 0-3; C6H4 is unsubstituted or substituted with a C1-10 alkyl or alkenyl; A and A′ are each independently a linking moiety representing an ester, a keto, an ether, a thio, an amido, an amino, a C1-4 fluoroalkyl, a C1-4 fluoroalkenyl, a branched or straight chained polyalkylene oxide, a phosphate, a sulfonyl, a sulfate, an ammonium, and mixtures thereof; L and L′ are each independently a C1-30 straight chained or branched alkyl or alkenyl or an aryl which is unsubstituted or substituted; Z is a hydrogen, carboxylic acid, a hydroxy, a phosphato, a phosphate ester, a sulfonyl, a sulfonate, a sulfate, a branched or straight-chained polyalkylene oxide, a nitryl, a glyceryl, an aryl unsubstituted or substituted with a C1-30 alkyl or alkenyl, a carbohydrate unsubstituted or substituted with a C1-10 alkyl or alkenyl or an ammonium; G is an anion or cation such as H+, Na+, Li+, K+, NH4 +, Ca+2, Mg+2, Cl−, Br−, I−, mesylate or tosylate. In yet another embodiment, primary alkylamines comprising from about 6 to about 22 carbon atoms are used. Particularly preferred primary alkylamines are oleylamine (commercially available from Akzo under the trade name Armeen OLD), dodecylamine (commercially available from Akzo under the trade name Armeen 12D), branched C 16-C22 alkylamine (commercially available from Rohm & Haas under the trade name Primene JM-T) and mixtures thereof. wherein R 1 is C8-C16 alkyl, each of R2, R3 and R4 is independently C1-C4 alkyl, C1-C4 hydroxy alkyl, benzyl, and —(C2H40)xH where x has a value from 2 to 5, and X is an anion. Not more than one of R2, R3 or R4 should be benzyl. b) fatty alcohol ethoxylates, R—(OCH 2CH2)aOH a=1 to 100, typically 12-40, R=hydrocarbon residue 8 to 20 C atoms, typically linear alkyl. Examples polyoxyethylene lauryl ether, with 4 or 23 oxyethylene groups; polyoxyethylene cetyl ether with 2, 10 or 20 oxyethylene groups; polyoxyethylene stearyl ether, with 2, 10, 20, 21 or 100 oxyethylene groups; polyoxyethylene (2), (10) oleyl ether, with 2 or 10 oxyethylene groups. Commercially available examples include, but are not limited to: ALFONIC, BRIJ, GENAPOL, NEODOL, SURFONIC, TRYCOL. wherein R 8 is an alkyl group or an alkyl aryl group, selected from the group consisting of primary, secondary and branched chain alkyl hydrocarbyl groups, primary, secondary and branched chain alkenyl hydrocarbyl groups, and/or primary, secondary and branched chain alkyl- and alkenyl-substituted phenolic hydrocarbyl groups having from about 6 to about 20 carbon atoms, preferably from about 8 to about 18, more preferably from about 10 to about 15 carbon atoms; s is an integer from about 2 to about 45, preferably from about 2 to about 20, more preferably from about 2 to about 15; B is a hydrogen, a carboxylate group, or a sulfate group; and linking group Z is —O—, —C(O)O—, —C(O)N(R)—, or —C(O)N(R)—, and mixtures thereof, in which R, when present, is R8 or hydrogen. Further nonlimiting examples include nonionic surfactants selected from the group consisting of fatty acid (C 12-18) esters of ethoxylated (EO5-100) sorbitans. More preferably said surfactant is selected from the group consisting of mixtures of laurate esters of sorbitol and sorbitol anhydrides; mixtures of stearate esters of sorbitol and sorbitol anhydrides; and mixtures of oleate esters of sorbitol and sorbitol anhydrides. Even more preferably said surfactant is selected from the group consisting of Polysorbate 20, which is a mixture of laurate esters of sorbitol and sorbitol anhydrides consisting predominantly of the monoester, condensed with about 20 moles of ethylene oxide; Polysorbate 60 which is a mixture of stearate esters of sorbitol and sorbitol anhydride, consisting predominantly of the monoester, condensed with about 20 moles of ethylene oxide; Polysorbate 80 which is a mixture of oleate esters of sorbitol and sorbitol anhydrides, consisting predominantly of the monoester, condensed with about 20 moles of ethylene oxide; and mixtures thereof. Most preferably, said surfactant is Polysorbate 60. 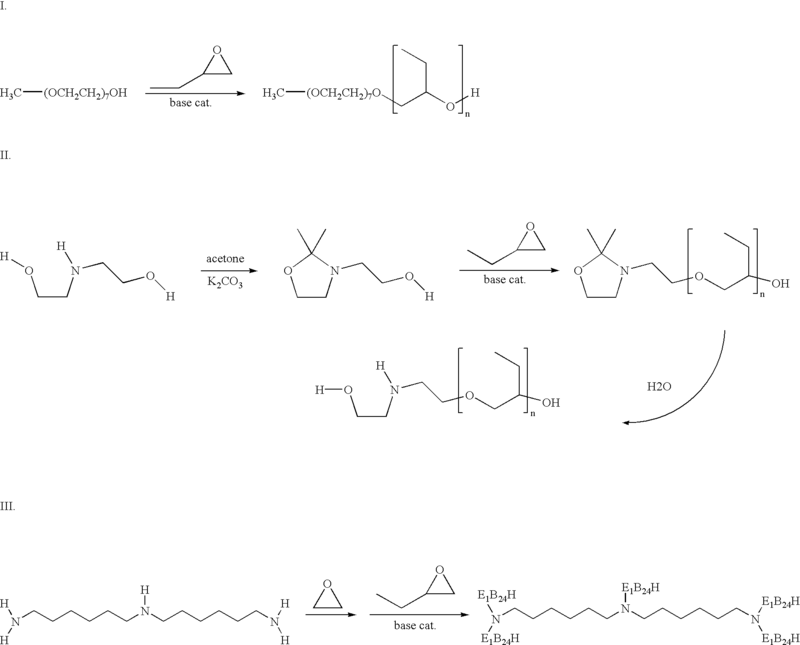 Other examples of ethoxylated surfactant include carboxylated alcohol ethoxylate, also known as ether carboxylate, with R 8 having from about 12 to about 16 carbon atoms and s being from about 5 to about 13; ethoxylated quaternary ammonium surfactants, such as PEG-5 cocomonium methosulfate, PEG-15 cocomonium chloride, PEG-15 oleammonium chloride and bis(polyethoxyethanol)tallow ammonium chloride. Other suitable nonionic ethoxylated surfactants are ethoxylated alkyl amines derived from the condensation of ethylene oxide with hydrophobic alkyl amines, with R 8 having from about 8 to about 22 carbon atoms and s being from about 3 to about 30.
wherein R 2 is selected from the group consisting of alkyl, alkylphenyl, hydroxyalkyl, hydroxyalkylphenyl, and mixtures thereof in which the alkyl groups contain from 10 to 18, preferably from 12 to 14, carbon atoms; n is 2 or 3, preferably from about 1.3 to about 3, most preferably from about 1.3 to about 2.7. The glycosyl is preferably derived from glucose. wherein R 1 is H, or R1 is C1-4 hydrocarbyl, 2-hydroxy ethyl, 2-hydroxy propyl or a mixture thereof, R2 is C5-31 hydrocarbyl, and Z is a polyhydroxyhydrocarbyl having a linear hydrocarbyl chain with at least 3 hydroxyls directly connected to the chain, or an alkoxylated derivative thereof. Preferably, R1 is methyl, R2 is a straight C11-15 alkyl or C16-18 alkyl or alkenyl chain such as coconut alkyl or mixtures thereof, and Z is derived from a reducing sugar such as glucose, fructose, maltose, lactose, in a reductive amination reaction. In one embodiment, the anionic surfactants include alkyl alkoxylated sulfate surfactants hereof are water soluble salts or acids of the formula RO(A) mSO3M wherein R is an unsubstituted C10-C24 alkyl or hydroxyalkyl group having a C10-C24 alkyl component, preferably a C12-C20 alkyl or hydroxyalkyl, more preferably C12-C18 alkyl or hydroxyalkyl, A is an ethoxy or propoxy unit, m is greater than zero, typically between about 0.5 and about 6, more preferably between about 0.5 and about 3, and M is H or a cation which can be, for example, a metal cation (e.g., sodium, potassium, lithium, calcium, magnesium, etc. ), ammonium or substituted-ammonium cation. Alkyl ethoxylated sulfates as well as alkyl propoxylated sulfates are contemplated herein. Compositions according to the present invention may further comprise a polar solvent. Non-limiting examples of polar solvents include: water, alcohols, glycols, polyglycols, ethers, carbonates, dibasic esters, ketones, other oxygenated solvents, and mixutures thereof. Further examples of alcohols include: C1-C126 alcohols, such as propanol, ethanol, isopropyl alcohol, etc . . . , benzyl alcohol, and diols such as 1,2-hexanediol. The Dowanol series by Dow Chemical are examples of glycols and polyglycols useful in the present invention, such as Dowanol TPM, TPnP, DPnB, DPnP, TPnB, PPh, DPM, DPMA, DB, and others. Further examples include propylene glycol, butylene glycol, polybutylene glycol and more hydrophobic glycols. Examples of carbonate solvents are ethylene, propylene and butylene carbonantes such as those available under the Jeffsol tradename. Polar solvents for the present invention can be further identified through their dispersive (□ D), polar (□P) and hydrogen bonding (□H) Hansen solubility parameters. Preferred polar solvents or polar solvent mixtures have fractional polar (fP) and fractional hydrogen bonding (fH) values of fp>0.02 and fH>0.10, where fP=□P/(□D+□P+□H) and fH=□H/(□D+□P+□H), more preferably fp>0.05 and fH>0.20, and most preferably fp>0.07 and fH>0.30. Bleaches, especially oxygen bleaches, are another type of cleaning adjunct suitable for use in the compositions of the present invention. This is especially the case for the activated and catalyzed forms with such bleach activators as nonanoyloxybenzenesulfonate and/or any of its linear or branched higher or lower homologs, and/or tetraacetylethylenediamine and/or any of its derivatives or derivatives of phthaloylimidoperoxycaproic acid (PAP; available from Ausimont SpA under trademane Euroco) or other imido- or amido-substituted bleach activators including the lactam types, or more generally any mixture of hydrophilic and/or hydrophobic bleach activators (especially acyl derivatives including those of the C 6-C16 substituted oxybenzenesulfonates). Preferred insect and moth repellent cleaning adjuncts useful in the compositions of the present invention are perfume ingredients, such as citronellol, citronellal, citral, linalool, cedar extract, geranium oil, sandalwood oil, 2-(diethylphenoxy)ethanol, 1-dodecene, etc. Other examples of insect and/or moth repellents useful in the compositions of the present invention are disclosed in U.S. Pat. Nos. 4,449,987; 4,693,890; 4,696,676; 4,933,371; 5,030,660; 5,196,200; and in “Semio Activity of Flavor and Fragrance Molecules on Various Insect Species”, B. D. Mookherjee et al., published in  Bioactive Volatile Compounds from Plants, ACS Symposium Series 525, R. Teranishi, R. G. Buttery, and H. Sugisawa, 1993, pp. 35-48, all of said patents and publications being incorporated herein by reference. 1. A consumable detergent composition comprising a polyoxyalkylene polymer comprising C4 or higher molecular weight alkylene oxide monomeric units, C1 or higher molecular weight glycidyl ether monomeric units, or combinations thereof and having a solubility at room temperature of at least 1/2% by weight in the lipophilic fluid the polymer is to be used with. 2. A consumable detergent composition according to claim 1 wherein the polyoxyalkylene polymer is at least 1% by weight soluble at room temperature in the lipophilic fluid. 3. A consumable detergent composition according to claim 1 wherein the polyoxyalkylene polymer is functionalized with polar, hydrophilic or both polar and hydrophilic substituents selected from the group consisting of alcohols, polyols, amines, polyamines, alkanolamines, ethoxylated and/or propoxylated amines, amides, ethoxylated and/or propoxylated amides, polyamides, urethanes and polyurethanes, oxyethylene, polyoxyethylenes, oxypropylene, polyoxypropylenes, carboxylic acids and salts, aminocarboxylates, amidocarboxylates, mono and diphosphate esters, phosphonates, aminophosphonates, monosulfates, sulfonates, amine oxides, quaternized amines, phosphine oxides, phenols, polyfunctional chelant groups,and combinations thereof. 4. The consumable detergent composition according to claim 1 wherein said polyoxyalkylene polymer comprises butylene oxide monomer units. 5. A cleaning composition comprising lipophilic fluid and polyoxyalkylene polymers comprising C4 or higher molecular weight alkoxide monomeric units and having a solubility at room temperature of at least 1/2% by weight of the lipophilic fluid. 6. A cleaning composition according to claim 5 wherein the lipophilic fluid is D5. 7. A cleaning composition according to claim 6 wherein the polyoxyalkylene polymer is functionalized with polar, hydrophilic or both polar and hydrophilic substituents selected from the group consisting of alcohols, polyols, amines, polyamines, alkanolamines, ethoxylated and/or propoxylated amines, amides, ethoxylated and/or propoxylated amides, polyamides, urethanes and polyurethanes, oxyethylene, polyoxyethylenes, oxypropylene, polyoxypropylenes, carboxylic acids and salts, aminocarboxylates, amidocarboxylates, mono and diphosphate esters, phosphonates, aminophosphonates, monosulfates, sulfonates, amine oxides, quaternized amines, phosphine oxides, phenols, polyfunctional chelant groups,and combinations thereof. 8. The cleaning composition according to claim 6 wherein said polyoxyalkylene polymer comprises butylene oxide monomer units. 9. A method for cleaning fabric articles, said method comprising contacting a fabric article in need of cleaning with a polyoxyalkylene polymer. 10. The method according to claim 9 wherein the the fabric article is pretreated with a consumable detergent composition containing polyoxyalkylene polymer prior to contacting the fabric article with a lipophilic fluid. 11. The method according to claim 9 wherein the fabric articles in need of cleaning is contacted with a cleaning composition comprising lipophilic fluid and polyoxyalkylene polymer in an automatic washing machine. R14 is independently selected from H; an alkyl aryl and/or an ether containing alkyl; and R15 is independently selected from H; an alkyl aryl and/or an ether containing alkyl, provided that at least one of R14 and R15 are other than H; v is 1-100; w is 2-100; x is 0-100; y is 0-100; z is 0-100; and provided that the sum of x and z is >0.